After a much deserved break, London’s T-Shirt Party are back with the 53rd installment of their series, and the first of their unmistakable designs that will be dropping every week from now. 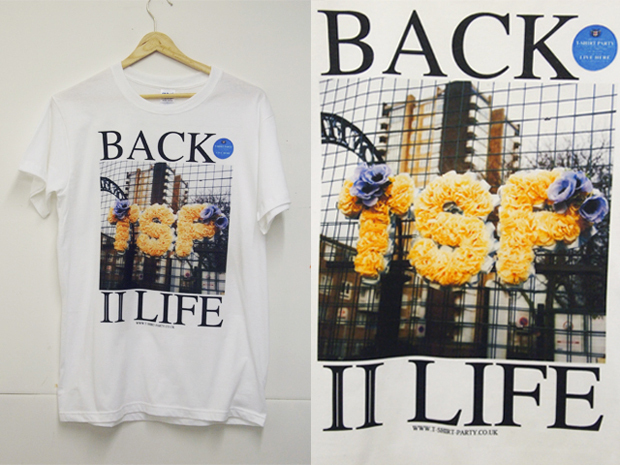 The print on the front of the tee pays homage to the Soul II Soul hit, with text reading ‘Back II Life’ wraped around an image of massed floral funeral letters spelling out TSP, flowers that seem to mark the memorial of the collection that finished last March after a 52 piece strong run. The previous collection was recently re-released before being put to rest last week to make way for the new designs. This comeback piece completely captures the essence of TSP and I fully rate what they’re about. Check out the accompanying video below and grab yours now from T-Shirt Party for £15.